History - where did it all start for me? Where did what start? So many things have started in order to lead to this trip. Here are just a few, in approximate chronological order. At the age of 11, my school offered me the opportunity to learn a musical instrument, a choice of trumpet, euphonium or violin. Yes, this will become relevant! On announcing this to my parents, I was shocked to discover that my mother had once played violin, and then excited to discover that she still had her instrument tucked away. Despite the almost hairless bow and only 3 gut strings, that evening marked the start of learning classical violin through to the end of high school and a musical career to follow. At the age of 12 I was introduced to kayaking at a local club, and was eventually hooked, despite the frustrations of being extremely small in a full-sized kayak, unable to lift it with any comfort and unable to steer it in the required direction, especially if the wind decided otherwise, and despite the muddy nature of the Deben estuary near England's east coast. Perseverance and encouragement led me to compete in slalom, reaching Division 1, laying the groundwork for a competitive nature that might otherwise have lain dormant. Following high school, I took out a year to work, travel and grow up a bit. At least two of the three happened! The travel involved packing my paniers and setting off by bicycle for effectively an anticlockwise tour of Europe that lasted for 18 weeks, taking in some magnificent mountain passes in the Pyrenees, the Alps, the Dolomites and anywhere else I could find. I moved on every day, camped wild much of the time, and generally was purposefully nomadic, always having an idea of where I would head next, but being free to vary this at will. That was my first real experience of travelling alone, being totally self-reliant, and it was formative, if not always pretty! There were ups and downs, not just of the hill variety, but I emerged mentally stronger, more resilient, more confident, more able to fend for myself than I had ever been. At university, wishing to develop some sort of skill on the dance floor other than utter humiliation, I took up Scottish dancing. This introduced me to a type of music that I had previously not encountered, and one which suddenly made me want to play the violin again (which had been developing an unhealthy layer of dust). Through dancing, I met friends who introduced me to opportunities to play more of this music, and that led to my playing fiddle in several Scottish dance bands throughout southern England. Fast forward several years, and it was through music that I first visited the US (see, it was relevant!) to play at a music and dance camp in Massachusetts. That was the trip on which I met the woman, Viveka, who would later (some say much later) become my wife, and which therefore led to my emigration to the USA. Sometime in the mid-1990s, a friend and I discovered that we both harboured an ambition to paddle the Devizes - Westminster Race, the premier long-distance race for canoes and kayaks in the UK, 125 miles along canal and River Thames, continuous for those foolhardy enough to try it. In preparation for this, I joined a local kayaking club in Oxford, learned how to paddle a racing kayak, and competed in marathon racing, progressing up through the rankings. Strangely enough, it was here that I had been, as a student, introduced to the idea of poling a canoe, and had spent a few happy weekends progressing along the River Thames in vertical orientation, blending in with the punts, never realising that I might someday consider doing this for real. Meanwhile, back in the US, Viveka and I rescued a delapidated (that's an understatement) cedar-strip canoe from a neighbour's woodpile - yes, sad but true! With minimal expertise, a few books, some guidance, and rather inadequate workshop space, we put it back together. This was the canoe which introduced me, with some help from Viveka, to the delights of canoe-camping. For several years we carried this canoe, which unfortunately weighed over 90 lbs, between lakes in the Adirondacks. And as our expeditions took us farther and farther afield, the carries became longer and ever less comfortable. That was the start of my thinking that it would be good to begin from scratch, someday to design and build a lightweight canoe. With emigration and marriage looming (yes, I've skipped all of the protracted decision-making process!) 2003 seemed like the last opportunity to paddle the Devizes-Westminster Race, so all was planned. Tracy's health at that time didn't allow her to paddle with me, but husband Phil was game, and, what's more, had previously completed this marathon. We were fit, well-prepared, had a great support crew, and were going fine in our double kayak .... until I went blind. All became hazy, until I could not even see the front of the kayak. This was problematical as I was in the bow, steering. Phil gave me directions as we manoeuvred close to large weirs on the River Thames, but our portages were so slow that we were going to miss the tide, and therefore be held up until the next ebb tide for the last stretch. The decision was taken to pull the plug at about 92 miles, and get me to hospital, where the opthalmologist said, "Never seen anything like that before." My vision recovered nearly as quickly as it had faded, but there remained the sense of defeat, the unfinished business. Did I mention a competitive streak? Well, Phil and I have that in common! 2003 saw me give up my teaching job of 18 years, sell my house, emigrate to the US (negotiating the less than straightforward US immigration process), get married, and have a significant birthday, many of life's major stressors in one fell swoop. Some might call it a mid-life crisis. That was the year that saw me take on a new life-style, one of self-employment as a musician (still relevant!) and freelance teacher. This life-style also allowed me the freedom to indulge the fantasy that I had been harbouring, that of designing and building my own cedar-strip canoes. After first building a workshop and gathering some tools, I then completed my first boat in 2007, a highly successful creation, and realised that there was, after all, the possibility of making this a commercial venture, as much as boat-bulding can ever be regarded as commercial! Not only the canoe but also Otter Creek Smallcraft was launched. Viveka and I now had (and still have) a canoe which weighed less than half of our restored original, and our canoeing trips ventured farther to more remote places. Back in the UK, unfinished business lingered. Phil and I resolved to put the Devizes-Westminster Race to bed the following Easter (2004). Of course, the Vermont winter ensured that I had no liquid water for training for several months leading up to the race, but, undeterred and paddle in hand, I ventured over to the UK to scratch that nagging itch. Our (my!) fitness was not as great as in the previous year, and our time was clearly going to be slower, but we were going OK ...... until I went blind again! This time Phil had fixed the footrests so that we could change positions, quite a feat considering our radically different leg lengths. So he took the bow. It wasn't pretty, but we made it, Phil dragging me home inside 22 hours. That's an itch I do not have to scratch again; the aftermath involved a LOT of pain and discomfort. My eyesight returned again, although the tendonitis and other aches took much longer. What took longest was the sheer exhaustion, probably mental. Why do I mention this? Well, it probably gives you a glimpse into my psyche, relevant no doubt to undertaking any extensive physical and mental challenge, be it climbing a mountain, hiking the Appalachian Trail or ... paddling the NFCT. In 2007, Viveka and I were out canoe-camping in the Adirondacks with our niece in our "hot-off-the-press" Otter Creek Smallcraft Lutra. 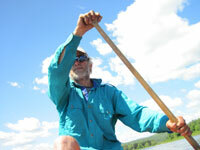 We had paddled Long Lake, and down the Raquette River. Going up Stoney Creek, we passed a solo paddler who seemed well-loaded but who was progressing well nevertheless. Later that evening, after we had camped near the south end of Upper Saranac Lake, the same paddler came along, looking for a camp-site. We were happy to share. This paddler turned out to be none other than Darrin Kimbler, in the very early stages of his NFCT through-paddle. I believe that was the first time that the Trail had entered my consciousness. After returning home I caught up with his blog, and prophetically closed one email to him with the word, "Someday ...". Nearly six years later, "Someday" arrived. In the intervening years I had done a lot of talking about paddling the Trail, but more recently had realised that talking about it doesn't really achieve very much. So, 10 years after celebrating a significant birthday with a total change of life, I celebrated another decade by challenging not only myself but also my craft with a personal odyssey along the NFCT.